Heat olive oil in a large skillet over medium heat. Add the ground beef (or turkey or chicken) and chopped onion. Brown completely, breaking up the meat as you go. 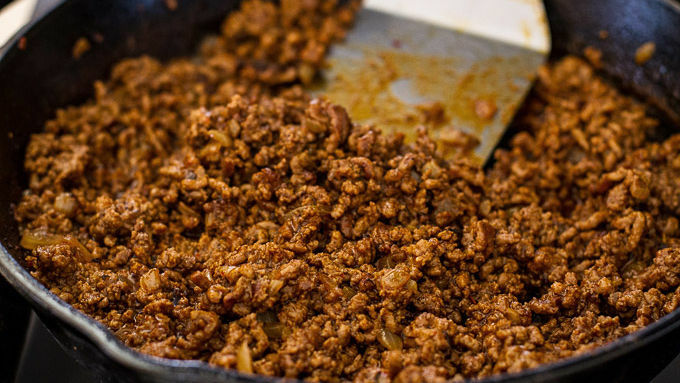 Once the meat is browned throughout and the onions are soft, add the water and taco seasoning. Give everything a good stir and simmer until the liquid has evaporated. Remove from heat. Warm the tortillas in the microwave for 15-30 seconds each, or until warm to touch. Working with one tortilla at a time, spread an even layer of refried beans over the entire top of the tortilla. 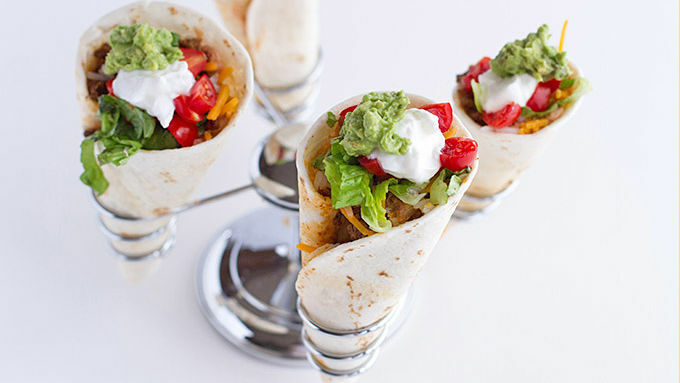 Down the center of the tortilla, layer the rice, cheese, meat, lettuce and tomatoes, adjusting fillings to suit tastes if desired. To form a cone, hold one end of the tortilla down and roll into a cone shape, keeping one hand on the bottom corner and spiraling the tortilla into a cone. Use a little of the refried beans to secure the edge in place. Top with guacamole and sour cream. Enjoy! 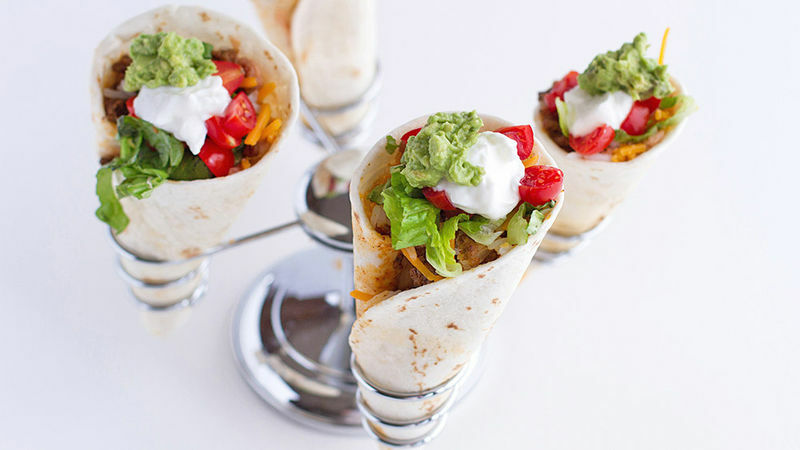 Fill these with any of your favorite taco fillings and toppings. The cones work great with almost anything! I don’t know about you, but I grew up on tacos. My family would eat them for dinner at least once a week. Simple tacos have always been a staple in our house and I'm certain they always will be. But while we all love tacos, sometimes it’s fun to try and reinvent them. You know, give em’ a little facelift. Spice up dinner without adding a whole lot of work. Enter taco cones. How fun would these be for a party? You can use ground beef, turkey or chicken. I went with ground beef since that's our favorite. Feel free to add whatever seasonings you wish here! I like to add in chipotle peppers, enchilada sauce, fresh peppers and whatever else I may have that sounds good that day. Be careful not to stuff too much in the center of the tortillas. 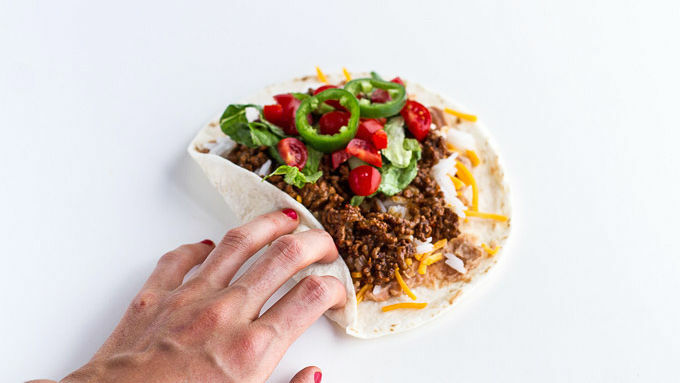 If you add too much, your taco will not form into a cone and everything will spill out. Serve with guacamole, sour cream (or Greek yogurt) and fresh cilantro. And dig in right away!